Griffith Sciences, inspired by strategic university, national and international change developed a framework called the Griffith Sciences Blended Learning Model to support innovative initiatives utilising technology and to build better practice in blended learning through the use of learning designs and blended learning principles in Science, Technology, Engineering and Mathematics (STEM) higher education. The blended learning model was formulated as a result of an implementation of new technology, to increase buy-in and sustain change in blended learning practice by nurturing the grass-roots initiatives of its academic and professional staff. 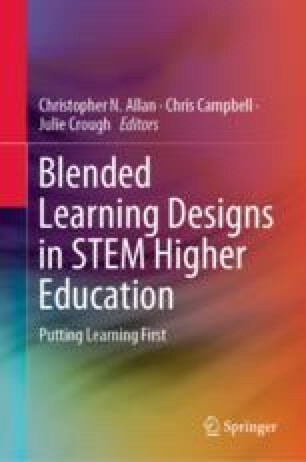 This chapter introduces the Griffith Sciences Blended Learning Model, how it is being used to implement and document blended learning principles and design in STEM education, the systematic training and support process developed, and the strategies used to promote the scholarly practice in learning and teaching. Conole, G. (2010). Learning design—Making practice explicit. Paper presented at the ConnectEd 2nd International Conference on Design Education. Retrieved November 7, 2018, from http://cloudworks.ac.uk/cloud/view/4001. Khatri, R., Henderson, C., Cole, R., Froyd, J. E., Friedrichsen, D., & Stanford, C. (2016). Designing for sustained adoption: A model of developing educational innovations for successful propagation. Physical Review Physics Education Research, 12(1). https://doi.org/10.1103/physrevphyseducres.12.010112.